Today is an incredibly exciting day for me. 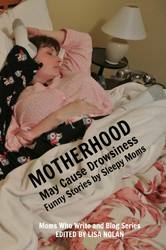 Today is the book launch for Motherhood May Cause Drowsiness!!! It is my first time being a published author!!! Several very funny mom bloggers, as well as myself, collected our best work along with some yet to be seen stuff and it is now available in paperback or digital editions on Amazon! A big shout out goes to my editor, Lisa Nolan, who made all of this possible! So if you want to read about sleep deprived moms, the crazy things we do while totally exhausted, and the hilarity that follows, click the picture below. Please check back and let me know what you think of it. I am dying to hear reviews. PS- Yes, that is me on the cover, as well as my six-year-old’s foot on my head. I didn’t know that was you in the cover photo! I love that picture — so funny! Can’t wait to read the book! Thanks! My husband snapped the pic a year ago when this was just an idea. We used it for the FB pages and blog buttons. I never thought for a moment it would be the cover. I am really excited. Can’t deny it! Great day for you! Congrats! Spreading the love around!